If you don't already know, I have a little list of interviews that I'm going to share with everybody during this THANKSGIVING holiday month. I want to properly prepare all you mamas out there for the big 2013 resolutions coming up. So, to help inspire and motivate everybody to be their best this coming year -- really make it the healthiest and most active one yet -- I have compiled a few fun interviews with working moms, some athletes and some celebs that can share some of their stories. 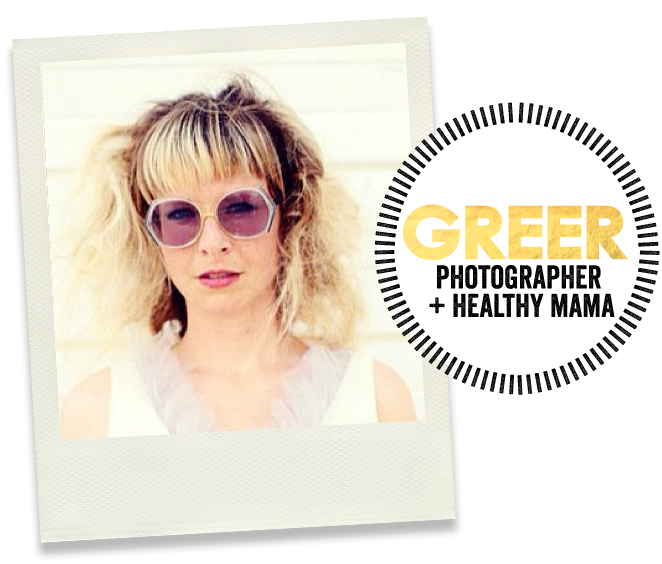 Today I'd like you all to meet the talented, hard-working healthy Mama Greer! Me: Hi Greer. I'm excited to have you on my blog today. Please tell PURE Mamas a bit more about yourself and who you are. Greer: I am Greer Inez aka Mama Hussy. My [extended] family adopted that European way of life & we are very involved in each other's every day life, so Oklahoma is our home most months of the year since our family is here, but we have a deep love for the ocean & try to spend a few months of the year at our other home in Southern California. Although the Pacific is paradise, I actually miss Oklahoma, we have a lot of loves in the Okie-state. I am a photographer that is super committed to my family's health + happiness. In my professional world, I use photography + style to help rad individuals share their brave business, their crazy beautiful lives, and their creative purpose. Although I have found ways to nourish my family while we travel, I am quite a home-body. Home is where I prefer to be so that I can prepare [nourishing] food just the way I desire. So much of the understanding & fulfillment goes into getting to prepare it myself. Q: What keeps you inspired to keep your family healthy on a daily basis? Well, I don't know anyone that likes being sick, so fighting off illness is plenty motivation. Also, my dad is a professional runner that ran for Nike throughout my childhood and he has always been an inspiration to stay healthy so I can enjoy life to the fullest; whether that is run a 5k with a group of girlfriends, hike a gorgeous canyon with my kid strapped to my back, or shred the Rockies like I'm still 13 years old. I believe in rewarding the body, and it will continue rewarding you. Q: Do you have any tips for those mamas who think it requires a lot of knowledge to be a healthy mom? There is nothing I want to know more about, than how to keep my family healthy + happy + alive as long as possible. Nourishment is a sure resource in doing this. So finding time to research a bit is well worth it. It won't take much time, because it will soon become a way of life. Find other like-minded people with whom to discuss these things. I find mine in my yoga community, my kid's school, my clients. Ask questions at your local natural food market. Find some good websites that show you tips/tricks on how to stay healthy & nourish your body. Pure Mamas is a huge fave in my circle of mamas. You'll learn quickly & it will soon just become your way of life. Q: A lot of people also say it costs too much money to eat organic and be vegan? I have been a healthy eater through many financial ups & downs. I doubt anyone could be poorer than I was in graduate school in Denver, and that was when I actually learned most about eating healthy. Most of my biggest influences do it on a budget. It is very possible to eat organic and vegan on a tight budget. It is my first commitment. Just like financial advisers say, "pay yourself [savings] first, then what you have left is what you can play with." Meaning, make sure you are always saving. I too feel this way about health, "nourish yourself first, then what you have left is your play [entertainment, clothes...] money." Adjust your priorities until you practice this. It might take some serious adjustments, it might take a few; but it's the most important thing you can do. Q: Do your kids eat healthy? How do you keep up their immune systems? Yes! I have to do the same kind of hiding for my husband, as I do with my kid. We all eat similarly in our house, grazing small meals/snacks all day long. Papa Hussy occasionally indulges in his own way outside of the house. We indulge as a family when the time is right. As for our immune systems, we stick to my fab five. But through the winter, bump it up with a few more warriors like sambucus, colloidal silver, oil of oregano, apple cider vinegar... Papa Hussy is the one that might choose not so many greens & supplements, but my kid sticks to my same habits/lifestyle. Q: What do you say when people ask you about protein? [giggle.] This seems to be an ongoing subject when discussing a vegetarian diet with meat-eaters. It's their favorite argument to continue eating their meat. I just personally don't like meat. I know too much about it. Yuck. Sufficient protein is not a difficult thing to remedy without meat. My diet is packed with protein. Some of my favorites are quinoa, avocados, sprouts, spinach, hummus, beans, nuts. (I, personally, choose to steer clear of soy + dairy.) There are many protein options in a vegetarian diet. A pescetarian diet is great also. I think all diets are doable in a healthy way. I try to think about making sure I get all the vitamins/untrition I need to give my body, not all the yummy things I'm sacrificing. Just get healthier, get the nutrition you need! Q: Finally, tell us about this blog of yours. What is your motivation for doing it? Mama Hussy was created as a personal journal. But I have also made some lovely relationships through it. It's a way for me to share the things I know to be good. It's a place for me to document the things I often discuss with people. I also keep an update on our family happenings, it remains a personal journal in a lot of ways. It's amazing how much I refer to it for sheer nostalgia. I'm a nostalgic person, the internet has become a way for to document my life in a digital realm. Digital self-preservation. hehe. Q: Any favorite recipes or dinner ideas you'd like to share with us? Something quick and easy that you have come to love? That your kids might love? I've got a pasta-lovin' family. With a fridge packed with our own veggies from our garden & since moving to OKC local organic veggies from our local co op, urban organics ok. So we get creative in our kitchen. marinara (from scratch if I have time. glass jar if I'm in a hurry.) with roasted sweet potatoes + roasted red bell pepper pureed into my marinara. After having Lennon, I continued the brilliance of pureed baby food into adult sauces & this will forever be a habit in The Hussy house. whatever veggies I have in my fridge in a skillet with braggs + your choice of cooking oil. WOW! what a catharsis. Thanks for asking. & featuring me on your beautiful blog!! I've been a fan! November 13, 2012 by Juli Novotny.